First and foremost has been a patient, understanding, and effective teacher in the field, in the lab, and around the display tables. Wrote one of the first well-illustrated color mushroom guides-Mushrooms of North America-an excellent book that unfortunately no longer is in print. Has been NAMA's most active institutional trustee, attending many annual meetings, offering advice, serving on committees, and on occasion providing a calming influence when tensions ran high. Has served as mycologist-chief, staff and volunteer-at NAMA forays too numerous to list, beginning in 1966 at Priest Lake, ID, and stretching to this year's event here in Asheville. He also has found time to head up many local and regional forays from Los Angeles to southern Idaho to New Mexico to Wildacres in the nearby Blue Ridge Mountains. Mentored many of the current generation of mycologists and encouraged them to continue the tradition of interacting with amateurs that he inherited from his own advisor, Alex Smith. Led successful NAMA international forays to Scandinavia (1978), Austria-Yugoslavia (1980), and Czechoslovakia (1983), arranging for interactions with many prominent European mycologists in the people-to-people spirit that was at the heart of NA b MA's origins in the Eisenhower years. Taught, for many years, a very popular summer mushroom class at Flathead Lake, MT, including one in association with the 1973 NAMA foray there. In recognition of these and many other activities, in 1981 Orson received NAMA's highest honor-the Award for Contributions to Amateur Mycology. Before going further, we would be remiss not to acknowledge the other half of Team Miller-Orson's wife Hope. Orson usually gets top billing, but all who know them recognize that their successes come from a joint effort. Although many of us are well aware of Hope's considerable skills in cooking with mushrooms, her organizational talents, wealth of knowledge about mushrooms, and tolerance of Orson's habit of starting work earlier in the morning than anyone ought to should not be overlooked. In closing, NAMA's members past and present join with Orson's many friends and colleagues throughout the world in congratulating him on a remarkable career, thanking him for all he has done on behalf of NAMA and amateur mycology. During the festivities Fungi in Forest Ecosystems, which is dedicated to Orson, was unveiled. 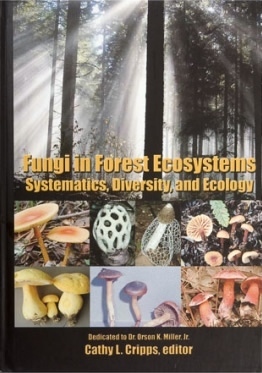 The cover describes the volume as "a compilation of research from around the globe that documents a diversity of fungi and the critical roles they play in forest health and, function." The topic for the book was selected to recognize both Orson's early career as a forester and his life-long passion for the higher fungi. Edited by Cathy Cripps, the book contains 28 contributions from 56 of his students and other colleagues from throughout the world, from Scotland to Switzerland, New Guinea to India, and Costa Rica to Korea. As the title suggests, the chapters are organized into three main sections: Systematics, Diversity, and Ecology. These follow a recounting of Orson's life and especially his mycological career, accompanied by a list of student theses completed under his guidance, a list of his published fungi, and a bibliography of his many books and articles. Among the interesting tidbits exposed are Orson's stints as poster supermodel for the Girl Scouts of America and his illustrious-albeit brieftelevision careers. The Systematics section includes 11 chapters, ranging from "Amanita subgenus Lepidella and related taxa in the southeastern United States," "Two remarkable taxa of Crepidotus from Bonin Islands (Japan) and new records from the Hawaiian Islands and Papua New Guinea," "New species of lignicolous basidiomycetes from Hawai'i," to "Three new boletes for Costa Rica." The inclusion of papers dealing with the Svalbard Archipelago and New Zealand's sub-Antarctic islands suggests that "forest ecosystems" was interpreted broadly. The Diversity section consists of only six chapters: "Subalpine conifer forests in the Alps, the Altai, and the Rocky Mountains: A comparison of their fungal populations," "Ectomycorrhizal epigeous basidiomycete diversity in Oregon Coast Range Pseudotsuga menziesii forests: Preliminary observations," "Biodiversity of wood-inhabiting fungi in Israeli pine forests," "Distribution and ecology of myxomycetes in southern Appalachian subalpine coniferous forests," "Macrolichens of the forests of Montana and Yellowstone and Glacier National Parks," and "Notes on fungi from the eastern highlands of Papua New Guinea." Like the first section, the final one, Ecology, comprises 11 chapters, including "Ectomycorrhizal fungi above and below ground in a small isolated aspen stand," "Fungal diversity and fruit body production in relation to vegetation structure, topography, and soil properties in a Quercus mongolica forest in central Korea," "Mycorrhizal associations in dryland riparian forests of the southwestern United States," "Diversity and role of ectomycorrhizal fungi on a revegetated mine site in southwest Virginia," and "Temporal and spatial variation in the spore rain of Gymnopus subnuda measured by the spore trap method." The papers are presented in academic style, and the illustrations are all in black and white. Nonetheless, most of the chapters should be readily accessible for any NAMA member curious to know what's out there in the woods and what the many fungi we seek are doing for a living. This review was published in the May-June 2005 issue of The Mycophile.